Ranks are only a visual distinction - they don't give any permission or authorization. Giving a member the rank "Moderator" or "Administrator" does not actually make them moderators or administrators. Members can only have special privileges when they are placed in a usergroup that contains special permissions.  There are six tabs: Home, General, Display, Users & Groups, Modules, and Misc. Click the "Users & Groups" to continue. Under the ranks category click "Ranks Administration"
Click the "Add new rank" at the right side of the page. 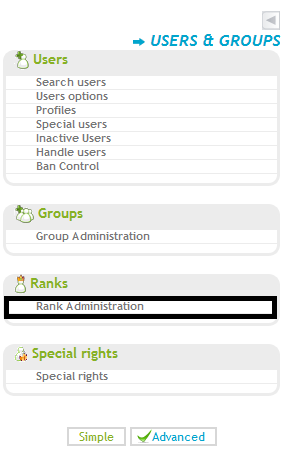 Once you arrive at "Rank Administration", click on the "Add new rank" button. Now you can create your rank! The "Rank Title:" field is where you put the title of the rank that you want to be shown for the user. You can set the rank to be special or not to be special. Special ranks must be assigned to someone by an administrator. Ranks that are not selected will be automatically given to users based off the amount if posts the rank is set to be given by. If someone has a special rank assigned to them, they will be unable to join any non-special ranks unless they have no special rank assigned. In the "Rank Image URL" box you can add the direct link for the image you want as a rank. If you don't have any custom images at the moment you can choose from the default ones. If you are looking for specially designed ranks created to your liking, be sure to send a graphic request with what you are looking for HERE. When you're done with your rank click the "Save" button to publish it. Limits: Only 95 Characters "Including spaces"
#9200DB - You can change this to any hex color value. You can also use "red" or "blue" instead of the hex code, you will need to remove the number sign though. The position of the color - You can change the which parts of the rank you want to be a certain color by leaving everything you don't want changed outside the code and everything you want changed inside. after the the first title you entered; place the second title after. The position of the bold font - You can change the which parts of the rank you want to be bold by leaving everything you don't want changed outside the code and everything you want changed inside. The position of the italicized font - You can change the which parts of the rank you want to be italicized by leaving everything you don't want changed outside the code and everything you want changed inside. This tutorial was written by Forumedic.